Eventide founder at the original location in New York City's 54th Street, 1971. 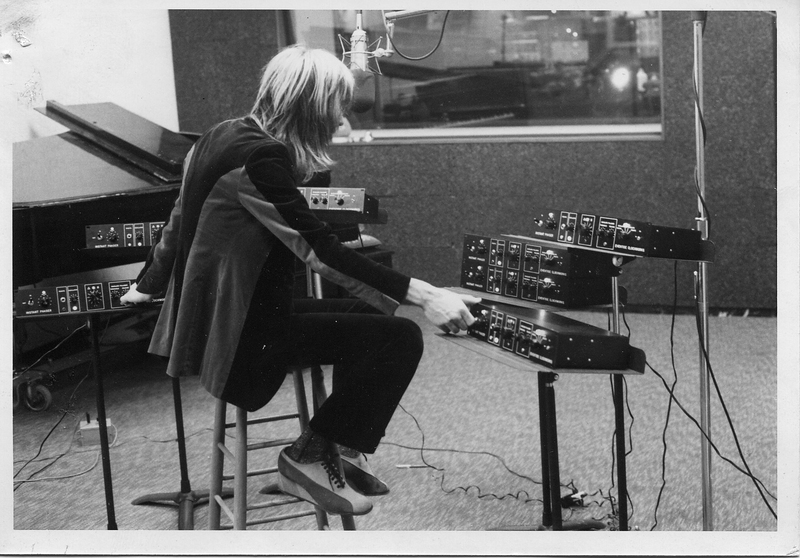 Working on the original H910 Harmonizer®, the world's first studio FX box, in 1973. An early adopter of Eventide products in the studio with Instant Phaser. So we had a name. An improbable name by the standards of the day, it being 1970. Now we needed a business. The stuff we had been making wasn't particularly inspiring. Our original "product" was a tape search unit for the Ampex MM1000 multitrack recorder. 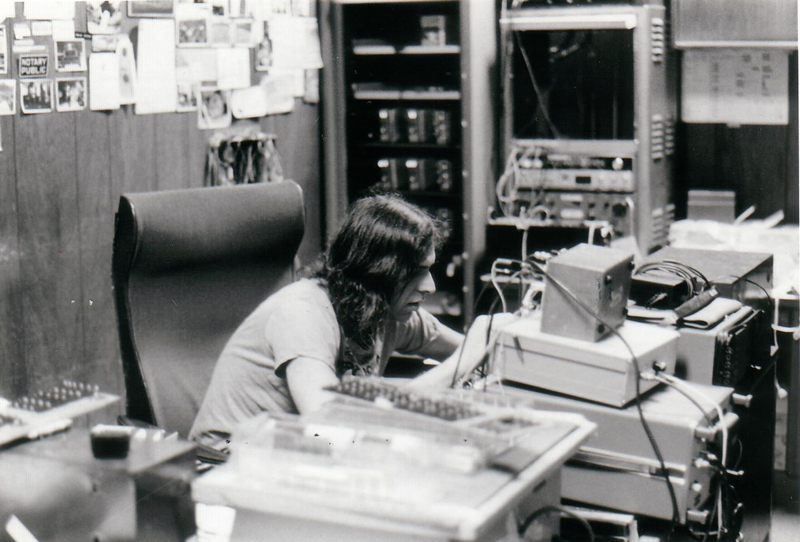 Eventide had its start in a small New York studio where there was no room for a "tape op." 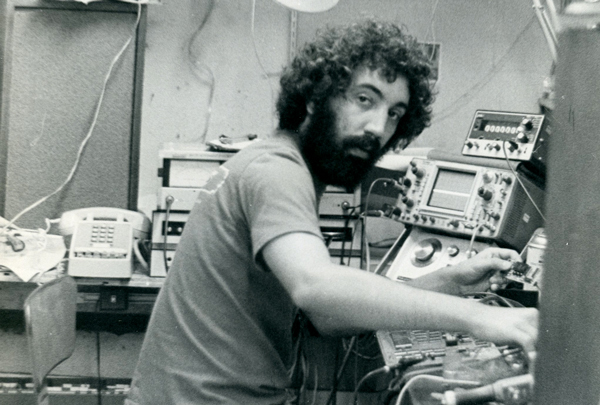 Co-founder Steve Katz requested co-founder Richard Factor to build a gadget that Katz could use to return the tape to a specific location. Co-founder Orville Greene, owner of the studio, financed the initial unit. The unit was an immediate success, allowing Katz to engineer records solo. In a spasm of zeal he presented the unit to the Ampex representative, who notified the factory, which said "we need some of them!" Hence we survived for a while OEMing tape search units and a handful of other low (very low) volume products such as a two-second delay line for telephone research and an electrostatic deflector for dispensing nanoliter quantities of chemical reagents. In this first year we also presented at the Audio Engineering Society meeting in NYC a fanciful aggregation of "products" that we were unable to demonstrate due to the complete lack of any internal electronic components, but that we felt nonetheless might attract some custom were they realized in commercial form. From this show, and from a fortuitous order by Maryland Public Broadcasting, came our initial product line, the Instant Phaser® and, for Maryland, a digital delay line giving two channels of independent delay from a single input. The delay went from 0 to 200 milliseconds, which required a hundred shift registers and lots of patience to get them working. This became the classic model 1745 Digital Delay Line, which rapidly transmogrified to the 1745A (using shift registers that required far less patience and having nice LED readouts) and finally to the 1745M, in which appeared, for the first time (we believe) Random Access Memory in an audio product. This modular product also sported an optional pitch change module, another novelty in that it was the first such product available with a frequency response suitable for music. The above paragraphs summarize over thirty years of our history of innovation. Eventide equipment is pervasive in recording and broadcast facilities, police stations across the nation, and aircraft around the world. Our industry-leading special effects equipment is audible on almost all popular recordings. Our digital voice logging recorders capture the history of civilization, frequently in minute detail. Our goal is to continue making neat, innovative stuff, and perhaps a few of the bucks, too. Wish us luck!